WELCOME TO A WORLD OF CLARITY. WELCOME TO MEDICAM. When it comes to zooming in on to a clinical /medical problem to get a clear picture, thousands of doctors have relied on one name. MEDICAM. An expert,many doctors team up with, to look deep inside one’s body and diagnose the exact problem. 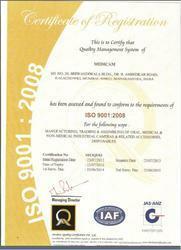 MEDICAM is an ISO 9001:2008 and ISO 13485:2003 company. Our state-of-the-art technology delivers the newest and most advanced cameras to the industry. And the CE marking assures that none of our products compromise on safety. Explains why medical practitioners trust MEDICAM and prefer to partner with us. This faith has given MEDICAM the much-needed confidence to take the next big step of diversification. With products like Video Borescopes, the company is now all set to foray into the industrial camera market. CAMERAS WITH A CLEAR VISION. AT HOME AND ABROAD. MEDICAM’s vision is to help medical practitioners to see solutions better. The technology we harness, the quality we pledge and the service we offer helps to turn it into a reality. Moreover, our strategic location in the heart of Mumbai enables us to feel the pulse of the industry. Thus, helping MEDICAM to become a trusted name. Not just in India, but also in countries like Australia, Romania, UK, USA, Europe and the Middle East. Manufacturing and Trading of Medical [Intra-Oral] cameras. MEDICAM focuses on achieving global standards in providing digital imaging solutions to the medical world. Since its inception in 2001, the company has emphasized on enhancing its innovative strengths and manufacturing expertise.A proven track record speaks for the fact that its focus didn''''t shift even once. Every year, MEDICAM’s product range is surprising the market pundits. The company’s technologies are putting thousands of patients at ease. Its cameras are helping doctors to create surgical breakthroughs in some the world’s most renowned medical institutions. The global associations are enabling us to harness top-of-the-line technology. And our ever-growing presence is giving our peers a reason to get back to their drawing boards. Today, with a robust portfolio, MEDICAM has become one of the eminent names in the medical equipment industry.Moreover, with its cost-effective innovations like Dental Intraoral Camera range, OPD ENT Camera, USB Video Dermatoscope, VIdeo Proctoscope USB, Screen Video Laryngoscope,Video Otoscope & various types of industrial Video Borescopes, the company has able to carve a niche for itself. All awards and participation certificates. 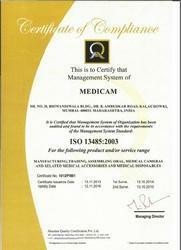 2001: MEDICAM begins its operation in Mumbai. 2002-03: Creates the revolutionary Intra Oral Dental Camera. 2004: Unveils a range of proprietory imaging softwares. 2005:Forces competitors to pause & think by introducubg Video Dermatoscope. 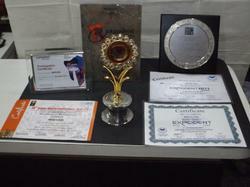 2013: Receives ISO 13485:2003 Certification. 2014: The complex procedure of intubation made easy with Video laryngoscope. 2015-16 : Invention of Screen Video Laryngoscope with multiple blades options. Hemant Palande, the Company''''s founder and the Chief Executive started as an entrepreneur at a very young age in the year 1991. In 1999. while dealing CCTV equipments, he began assembling medical cameras. Finally in 2001, he found his calling and HEMANT"S MEDICAM was launched.A dream saw the light of the day. Hemant''''s entrepreneurial skills soon came to notice.The list of clients started increasing.And the trade experts identified MEDICAM as a force to reckon with.And the trade experts identified MEDICAM as a force to reckon with. Udyogshri Publication conferred the title of "Udyog Shree" upon Hemant. He was the youngest person to receive this award then. QUALITY THAT SPEAKS FOR ITSELF.AND SILCENCES COMPETITION. Markets are ever-changing. Customers are becoming savvier. However, MEDICAM’s committed Research & Development (R&D) team makes gauging a trend easier. A team that comprises of technical designers, hardware engineers and production managers with surpassed knowledge; gives MEDICAM the much-needed innovative and competitive edge. For instance, the division has helped the company to redefine the concept of Intra Oral Cameras in India. Besides, a keen understanding of the clinical environment has enabled MEDICAM to market seven unique models of Intra Oral Cameras along with other dental equipments. Plus, by procuring world-class raw material and technology through cross-border tie-ups, the company has been able to craft a product line that meets varied requirements and suits every budget. Apart from delivering the newest and the most advanced imaging solutions to the medical world, MEDICAM boasts of an adept Service and Support Arm. An arm that decodes client’s requirements and encodes it into a user-friendly software, which forms an integral part of our every offering. Copyright protected and timely updated, these softwares are available to MEDICAM’s customers at a click of a button. of Intra Oral Cameras in India. A LENS FOR EVERY SEARCH. ---- AN INNOVATION FOR EVERY PROBLEM. Continuous innovation - that’s our motto at MEDICAM. A motto, which has created engineering breakthroughs like Video Laryngoscope USB, Video Proctoscope USB, USB Video Dermatoscope and OPD ENT Camera,Video Otoscope. These high quality digital imaging solutions have helped us to build strong partnerships with several doctors, dentists, hospitals and clinics. Also, at MEDICAM, along with innovating new products, we believe in reinventing ourselves. Exactly the reason why we have decided to venture into Industrial use (NDT) cameras. These cameras [Video Borescopes] are tiny devices, tiny enough to crawl through pipes, pistons or barrels and detect flaws if any. PARTNER WITH US. ZOOM ONTO A NEW TOMORROW. To see is to believe. See for yourself the array of innovations that we have to offer. Scan through our product range and select one that suits you the best. Then give us a call or then drop an email. We will be more that happy to partner with you today and do the best we can for a better tomorrow.